BROKERAGE BOAT! 1984 Carver 26 Santa Cruz Carver 26 Santa Cruz! Narrow Body Flybridge! With Trailer! Water Ready! BROKERAGE BOAT! Very good looking Carver 26 Santa Cruz. The ideal entry level, priced right, trailer-able Fly Bridge. The perfect Early Spring/Late Fall Boat with driving inside or on the bridge. 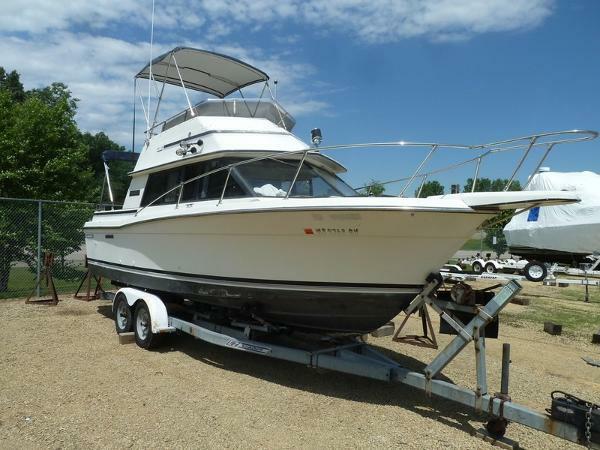 Powered by a MerCruiser, 5.7L 260HP/Alpha Drive that is clean and runs great! 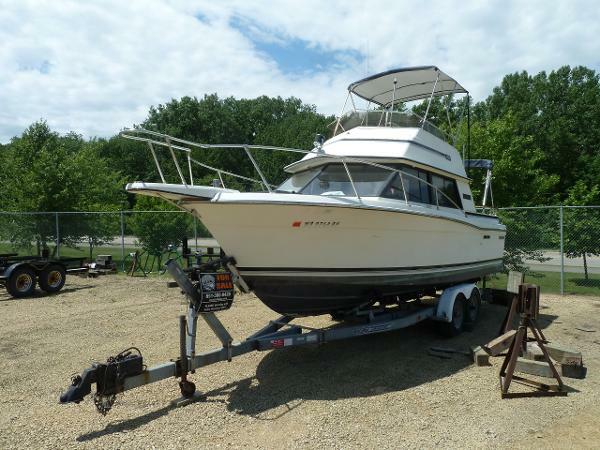 Boat is being sold with a EZ Loader Trailer and has some nice features including a Bridge Bimini Top and a Cockpit Bimini Top, Depth Finder, VHF Radio, Trim Tabs, Refrigerator, Stove, Microwave, Electric Flush Head and a Nice Size Swim Platform with Boarding Ladder! This boat is off location Manufacturer Provided DescriptionThe Carver 26 Santa Cruz is the easiest way to get into boating. Its roomy cabin affords all-around seated visibility plus sleeping room for four. There's a large private V-berth forward, and a dinette - lounge in the salon that easily converts to a double berth for the kids. 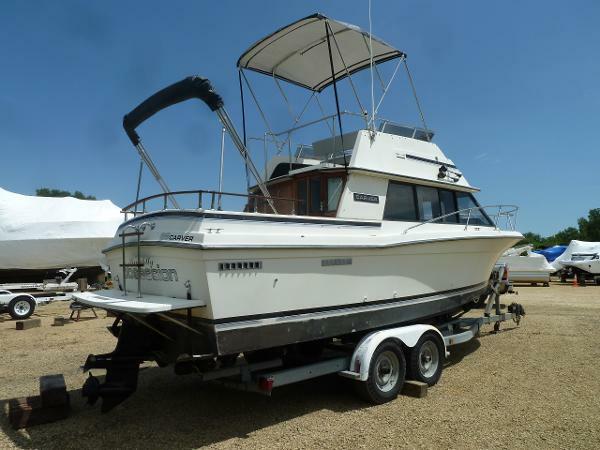 The Santa Cruz also features a fully equipped galley with a stove and a refrigerator. The head compartment includes a vanity and a pressure hot-water shower. Its command bridge provides comfortable seating and a console with full instrumentation. Dual station controls are standard.26 Carver Equipment List Compass Depth Finder Horn VHF Radio Stereo Refrigerator Stove Microwave Water System Water heater Battery Charger Battery Switch Bilge blower Bilge Pump Wiper Dockside Power with Cord Electric Flush Head Bimini Top/Bridge and Cockpit Anchor Swim Platform with Ladder The Company offers the details of this vessel in good faith but cannot guarantee or warrant the accuracy of this information nor warrant the condition of the vessel. A buyer should instruct his agents, or his surveyors, to investigate such details as the buyer desires validated. This vessel is offered subject to prior sale, price change, or withdrawal without notice. Very good looking Carver 26 Santa Cruz. The ideal entry level, priced right, trailer-able Fly Bridge. The perfect Early Spring/Late Fall Boat with driving inside or on the bridge. Powered by a MerCruiser, 5.7L 260HP/Alpha Drive that is clean and runs great! 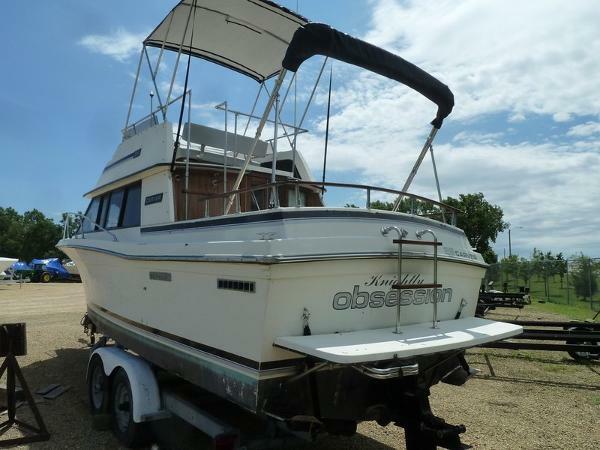 Boat is being sold with a EZ Loader Trailer and has some nice features including a Bridge Bimini Top and a Cockpit Bimini Top, Depth Finder, VHF Radio, Trim Tabs, Refrigerator, Stove, Microwave, Electric Flush Head and a Nice Size Swim Platform with Boarding Ladder!